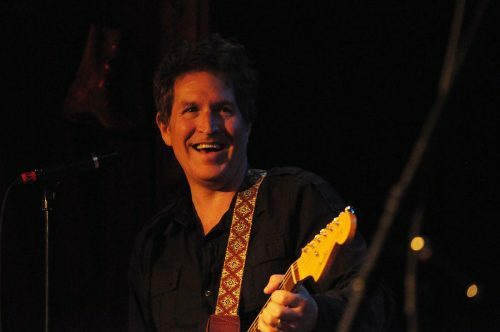 Starting with the Dream Syndicate in the early ’80s in L.A. and then going solo in 1990, Steve has released over 35 albums of lyrically driven rock, trying various stylistic approaches and line-ups (sometimes sharing the frontman spot as with his recent Baseball Project). His songs tend to take a single melodic element, and the musicians generally all play together without a lot of meticulous arrangement or second-guessing, with the magic hopefully (and more often than not) coming naturally out of the process of setting the right pieces in place. We discuss “Resolution” by Steve Wynn and the Miracle 3 from Northern Aggression (2010), “Punching Holes in the Sky” from Crossing Dragon Bridge (2008), and “There Will Come a Day” from Here Come the Miracles (2001). We wrap up by listening to “I’m Not Listening,” a 2007 Smack Dab song now re-released on Steve’s Sketches in Spain (2013). Opening/closing music: “Tell Me When It’s Over” by Dream Syndicate from The Days of Wine and Roses (1982). Learn more at stevewynn.net. Steve’s most recent release is soundtrack work that includes “Benedikt’s Blues.” Another song brought up is “Amphetamine.” Here’s a live version of “Resolution” with the Miracle 3. While the new Dream Syndicate album won’t be out until September, you can see the current lineup live now. Steve also has live shows as a solo performer. Steve also sings with the Baseball Project, which includes future NEM guest Scott McCaughey (Young Fresh Fellows), REM’s Peter Buck playing bass (now Mike Mills), and Miracle 3 drummer Linda Pittmon. Here they are on Letterman, and here’s a more recent tune. Another of his “super-group” projects from the ’90s was Gutterball; here they are live in 1993.